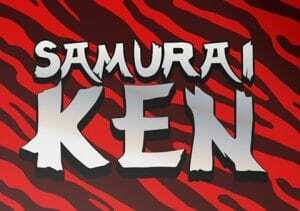 A martial arts loving tiger is the star of Samurai Ken, the second video slot to be released by Swedish developer Fantasma Games – in cooperation with Microgaming. This 5 reel, 20 payline game comes with classy Manga-style design, sticky win respins and a free spins bonus round. Play on your desktop, tablet or mobile from between 20p and £40 per spin. Fantasma Games has created an unusual looking game here. The reels are set against a mist-filled forest and include Asian style weapons, armour, treasure chests, coins and dragons. The best symbol is Ken the Samurai tiger who spins in a stacked formation and offers awards of 12.5 times your total bet if you manage to land 5 on a payline. There’s a cartoon aesthetic to the design which works very well. We’ve no complaints about the design here. What of the features? There are 2 main extras on offer. Sticky Win Respin feature – these can become active following a winning spin. The winning symbols become sticky and the rest of the reels spin again. Any symbols that match the original win join the winning cluster and another respin is awarded. These keep on coming until there’s a respin where no new winner is added. The overall cluster is evaluated and a final payout is then made. Free Spin Battle feature – land the scatter (the banner) on reels 1, 3 and 5 on the same spin to activate the free spins round. This is a battle bonus where Samurai Ken takes on the dragon. The results depends on what symbols land on reel 5. The free spins continue until Ken or the dragon is victorious. You can keep tabs on who’s winning via a special meter. Look out for wilds which are brought into play in the free spins too. They substitute for everything bar the scatter. Samurai Ken shares many characteristics with Fantasma Games’ first release, Super Sumo. The design is impressively done and the pair of features deliver plenty of action. The volatility here is in the medium to high range with top wins of 750 times your bet on each spin. We enjoyed Samurai Ken. With its high spec visuals and promising extras, it’s an entertaining package overall. We’re looking forward to seeing more releases from the Fantasma Games stable. If you like the theme, there’s no better video slot that NetEnt’s Warlords: Crystals of Power which features a highly rewarding samurai.